The Dow Jones industrial average hit a major milestone today, closing above 20,000 points for the first time. Investors pushed stocks higher after strong earnings reports and the market continued to be buoyed by President Donald Trump’s vow to cut regulations for businesses and slash corporate tax rates. The Dow gained 155.8 points to close out the trading session at 20,068.51. The S&P 500 and the Nasdaq composite joined the Dow in closing at all-time highs. The benchmark index has staged a remarkable comeback since losing almost half its value after the financial crisis in 2008. The Dow has been flirting with the 20,000 mark for weeks and has continued to rally since Trump’s election in November. After erupting in cheers at the crossing of the 20,000-point threshold during the market’s opening bell, some traders at the New York Stock Exchange also donned “Dow 20,000” hats to mark the occasion. NEW YORK When U.S. President-elect Donald Trump criticized United Technologies Corp’s (UTX.N) Carrier unit in November for its plan to move some 800 jobs to Mexico, the parent-company made a swift decision to keep the factory in Indiana. Swapping robots and software for human labor has underpinned much of the productivity gains in the United States over the last 25 years. Now, with a greater political push to keep factories at home, investors are betting that automation will gain speed in industries ranging from auto manufacturing to chicken processing to craft beer breweries. The big winners so far include Rockwell Automation Inc (ROK.N), General Electric Co (GE.N) and Cognex Corp (CGNX.O), which have seen jumps in fund ownership of 80 percent or more in the current quarter compared with the previous quarter, according to a Reuters analysis of Morningstar data. The ROBO Global Robotics and Automation Index ETF is up 7.5 percent since Election Day, or about 15 percent more than the S&P 500 index, after underperforming the broad market for the majority of last year. Its largest holdings include cleaning products maker iRobot Corp (IRBT.O), Japanese factory automation company Fanuc Corp< 6954.T>, and drone aircraft company AeroVironment Inc (AVAV.O). Declining costs of technology are expected to accelerate the growth of robotic manufacturing. Some 80 percent of companies that plan to cut jobs in the next year expect to partially replace workers with automation, according to a survey of chief executives by PwC released Monday. At the same time, developments in fields ranging from barcodes to digital measurement tools are allowing companies to hire fewer workers and reduce the time it takes to bring their products to the market. Brian Smoluch, a fund manager at the Portland, Oregon-based Hood River Small-Cap Growth fund (HRSMX.O), has been buying shares of Digimarc Corp (DMRC.O) because of its so-called invisible barcodes that speed up scanning of packages. “If it takes a nanosecond to scan something, it allows a retailer to have fewer people at a checkout counter and makes self-checkout an easier proposition,” he said. That said, the $300 million market cap company is a “high-risk, high-reward stock” because its success depends on companies adopting its technology over rivals. Eric Marshall, a fund manager at Dallas-based Hodges Capital, has been buying shares of digital measurement company FARO Technologies Inc (FARO.O) and kitchen equipment maker Middleby Corp (MIDD.O). Faro, for instance, creates three-dimensional measuring tools used in aerospace and automotive manufacturing. Shares of the company are up 18.8 percent since Election Day, triple the 6.3 percent gain in the broad S&P 500 index. Middleby, meanwhile, recently introduced robots which can prepare French fries as quickly as a human line cook, saving labor costs and improving reliability. Shares are up 12.8 percent since Election Day. “As labor costs go up you’re going to see more automated kitchens within fast-casual restaurants, and Middleby is one of the key innovators in that industry,” Marshall said. Republicans are likely to push tax policies that provide incentives to manufacture goods in the United States, regardless how the work is done, analysts say. The result could be that there are more goods made at home, without a significant reduction in the unemployment rate, which is currently at 4.7 percent as of December. “There could be a manufacturing renaissance in this country, but most of the work will be done by automation, with current workers retained to do value-added functions,” said Nicholas Heymann, analyst at William Blair who covers General Electric and expects it to be a boon to the company’s automation business. heavy rainfall, highway police said on Wednesday. people, according to a United Nations official. The webcast replay will be available until June 4, 2017. Services. Additional information is available at www.dctindustrial.com. here to subscribe to Mobile Alerts for DCT Industrial. Software And Robots Eat Jobs. Now What? In a story for Vox Monday, Matt Yglesias argues that we shouldn’t be worried about losing our jobs to robots — or to any other kind of sophisticated tech that can do the work of a human. What should worry us, Yglesias suggests, is the possibility that this doesn’t happen. 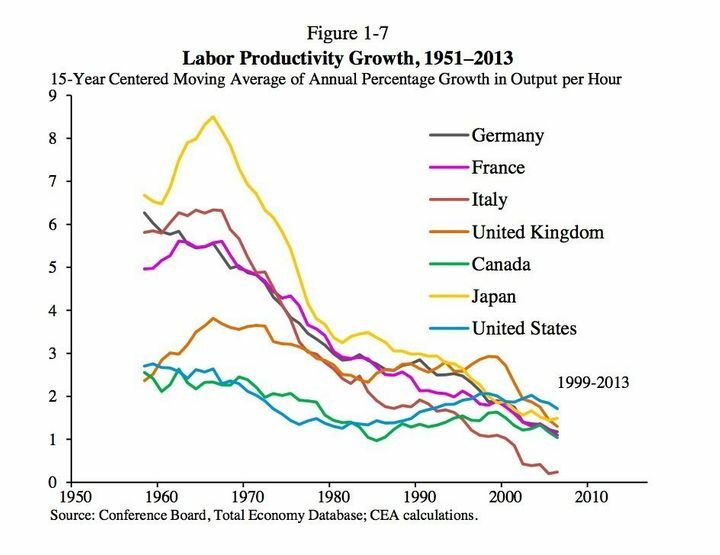 Yglesias cites the 2015 Economic Report of the President and the annual report from the Council of Economic Advisers, which do indeed show that labor productivity growth has tapered off. He suggests a number of policy changes for adapting to a world with less work, and those proposals are worth debating. These days people are perhaps more likely to book a reservation or order a takeout meal with an app rather than a phone call, but the core work of serving and preparing food has seen very little progress. Well, maybe. But observe the touch screens in use at your local McDonald’s — or read Dr. Atul Gawande’s 2012 New Yorker story about how the Cheesecake Factory has standardized and modernized its food-prep practices — and you might come to a different conclusion about what technology has already wrought. Then, watch the video of a robot chef embedded below and think about what’s coming in the next few years. This machine isn’t just playing the role of a microwave jockey in a fast-food restaurant. It’s producing restaurant-quality fare. The robot chef in this video is a prototype, but technology of this kind could be on the market in just a couple of years, according to the BBC. Soon, many restaurants will have screens that allow customers to order and pay for their food — which then may or may not be delivered by a human. Food preparation and food service are just the beginning. Yglesias is right that “we still don’t have robot doctors who can treat patients in lieu of costly and inconvenient human ones.” We can assume that “Dr. Watson” will still be in the waiting room for a few years yet, although IBM’s efforts to apply its software to medicine continue. We can also assume, however, that there are many, many people who currently a) work in some kind of customer-service capacity and b) don’t make life-or-death decisions on a daily basis. It’s these kinds of jobs that are most at risk in the decade ahead. 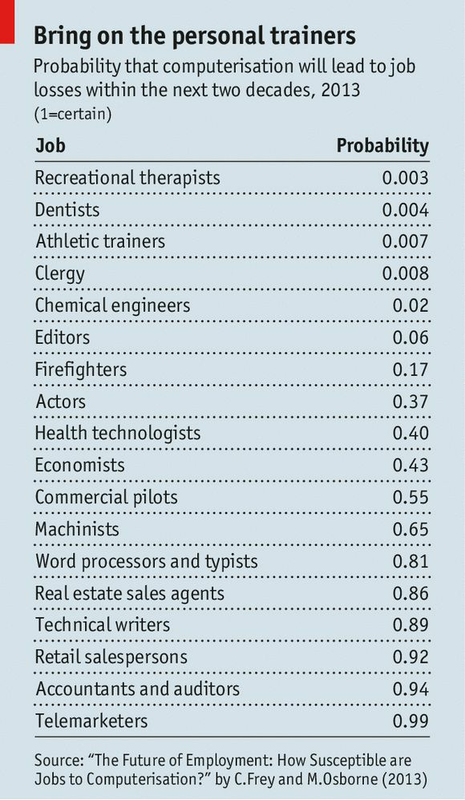 Telemarketers, accountants and retail workers are at the bottom of this chart from The Economist that lists the odds (as calculated by Carl Benedikt Frey and Michael A. Osborne, of the University of Oxford) that computerization will lead to job losses in various industries by 2023. Technical writers and real estate agents aren’t far behind. “The advances we’re seeing in artificial intelligence and machine learning will infiltrate the broader economy quickly,” MIT research scientist Andrew McAfee told The Huffington Post last week. A Japanese hotel run by robots shows what’s already possible. E-discovery software helps law firms to quickly find what they need amid reams of documents — a task that might once have required a room of paralegals to accomplish. Algorithms provide financial advice. And although Yglesias’ position at Vox is probably safe, anyone who does commodity reporting on quarterly results should fear the software that produces financial journalism for the Associated Press. The impact of technological advancement on peoples’ job prospects will probably grow. Many (though not all) of the experts surveyed on the future of jobs by the Pew Internet and Life Project last year believe that artificial intelligence, machine learning and automation will imperil white-collar jobs, from media to medicine to finance to law, along with many aspects of the retail, hospitality and customer service industries. The good news — as The Economist highlighted last year, and as Yglesias himself points out — is that technological innovations have historically delivered more jobs than they have destroyed. My bet, though, is that the wave of automation moving through the world right now is going to replace a lot of labor. That which can be automated will be. What we have less insight into is how well the people whose professions become obsolete due to advances in automation will be able to adapt. Detroit was ground zero for these kinds of challenges in the last century. While some kinds of retraining programs hold promise for displaced people, structural unemployment could be in the cards for a great many Americans — factory workers would be just the beginning. If self-driving trucks displace truckers, millions more could join the ranks of the disrupted. There’s a CVS in Washington, D.C. that I’ve been to, where one attendant watches over four automated checkers and provides customer support as needed. I predict we’re going to see a lot more of that kind of thing. What should we do about the fact that soon, many more people could lose their jobs to automation? In 2012, I wrote about a useful innovation agenda for the next president of the United States. In less than two years, it will fall to someone other than President Barack Obama to grapple with more economic disruption. We should all wish him or her luck in leading the country to help those most affected. Posted on March 1, 2017 Author chrisLeave a comment on Software And Robots Eat Jobs. Now What? When will the jobs return? That’s been the question in this glacially slow recovery. The answer? Many of jobs won’t be coming back, and that’s painful news for all of us. Low consumer demand is one reason. Companies have no reason to hire if people aren’t buying their products, and recession-wracked Europe, our biggest consumer, isn’t consuming as much. Yet there’s another reason for weak job creation that isn’t talked about as much. Automation, aided by new technologies, is increasingly replacing labor, changing workplaces and altering the economy in fundamental ways. For evidence of this trend, just look around your house, your office (if you’re fortunate enough to have one) and the nearest shopping center. o IPhones, iPads, and other devices are changing the way we shop, communicate and get news and information, disrupting old labor-intensive industries, such as newspapers and the U.S. Postal Service, while creating new ones that generally employ far fewer people. o Online banking, brokerage and mortgages are increasingly making it easier for consumers to never set foot in a brick-and-mortar bank. o Movie-downloading services such as Netflix and Redbox have hastened the demise of video stores. o Self-checkout aisles at stores and gas stations have eliminated thousands of retail jobs. Truck drivers’ jobs might soon be on the line too. Experiments with computer-driven vehicles have had vastly improved results in the past several years. In 2005, computer-driven cars could go only a few miles. Recently, Google-operated cars went thousands of miles without a mishap, and California Gov. Jerry Brown just signed a bill to allow them on the state’s highways. “At some point in the future — it might be many years or decades from now — machines will be able to do the jobs of a large percentage of the ‘average’ people in our population, and these people will not be able to find new jobs,” writes Martin Ford in his eye-opening book Lights in the Tunnel, which can be downloaded for free. This book details the challenges that we face and offers some possible solutions, including shorter work weeks, job sharing, and eliminating payroll taxes so employers have less incentive to replace workers. David Autor, an economist at MIT, points out that the job market has been “hollowed out,” with the jobs in the middle — clerks, administrative positions, factory workers — disappearing. At the same time, high-wage jobs have been created in computer programming and biotech. Low-wage, automation-resistant jobs in such industries as food service and health care are doing just fine. While government officials can and should worry about how to create more good-paying jobs, investors who have long suffered from a sideways stock market can profit by seeking out companies on the leading edge of the automation phenomenon. Examples include Rockwell Automation, which makes industrial systems; Irobot, a maker of automated tools such as vacuum cleaners and floor washers; Aerovironoment, which manufactures unmanned aircraft and other vehicles, and NCR, a great example of an old-line firm that morphed from mechanical cash registers to ATMs and automated check-in systems. Another approach to finding investment opportunities stemming from the automation trend is to look for stocks with high sales to employees. A recent survey by Bloomberg calls attention to some companies with high sales-to-employee ratios. Among them: Apple, eBay, Microsoft, Amgen and Google. Every industrial revolution has been accompanied by new technology that underpins the innovations, and that is also fertile ground for investors seeking growth. Microchips, computer storage, optical drives, LCDs, fiber optics and nanotechnology are just a few of the innovations that are driving the new economy. Green energy is another trend that’s here to stay. The list of these companies is long but worth investigating for investing ideas. The good news is that the United States has enormous capacity to supply needed goods and services (with less labor than ever before, which means higher productivity). Jobs are being replaced, to be sure. However, every scenario that Ford envisions won’t necessarily come to pass. Innovators in the global and U.S. economies will doubtless find new ways to make money. This could mean that today’s manufacturing jobs will be increasingly supplanted by more service jobs. For example, all of the new automation equipment will need servicing. One thing that seers of the high-tech future typically fail to envision is technology needs a lot of work to keep it running. Whatever the future holds along these lines, investing in old-line firms that are labor intensive seems to be an increasingly bad bet. Such companies tend to be mature, which typically means low-growth potential and low investment returns. By focusing on high-revenue companies that harness automation, however, you’ll be looking to the future. And after all, investing is all about the future. Yet it’s important to keep in mind that the future never unfolds as neatly as even the best seers predict — even when they’re basically right. The key is to keep abreast of economic developments to see new niches of investing opportunity developing as a result of the automation trend. On a brighter economic note, this investment will spur general economic growth that, for all we now know, could ultimately produce new jobs in areas that now we can’t even conceive. Ted Schwartz, a certified financial planner, is president and chief investment officer of Capstone Investment Financial Group. He advises individual investors and endowments, and serves as the adviser to CIFG UMA accounts. Because Schwartz has a background in psychology and counseling, he brings insights into personal motivation when advising clients on how to achieve their wealth management goals. Schwartz holds a B.A. from Duke University and an M.A. from Oregon State University. He can be reached at ted@capstoneinvest.com.